Looking for a super delicious treat your kids can make with you? Look no further! I found the recipe in the February 2010 issue of Real Simple magazine (pg 42). 1. Combine peanut butter, butter (brought to room temperature then melted in microwave 30 seconds at a time until completely melted), and powdered sugar. Do not beat just simply stir with scraper/spoon until thoroughly combined (this takes some muscle and patience). 2. Form into teaspoon sized balls (I made some of mine too big and they are better bite sized) and place on parchment lined baking sheet. Freeze for 10 minutes. 3. Melt chocolate in microwave, in 30 second intervals, stirring in between, until completely melted. Do not over heat or chocolate will scorch. 4. 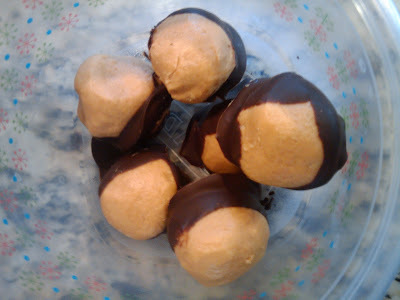 Partially dip peanut butter balls in chocolate and return to baking sheet. Leave the top peanut butter only, as shown in picture. I tried using a toothpick to dip them but using your hands works best. 5. Refrigerate 25-35 minutes or until firm. Store in refrigerator until ready to serve. I'll be honest I didn't let my kids help me this time but these are really easy and you don't need to use the stove or oven so they are perfect for the kids to help. They also only have 4 ingredients which makes them even simpler. Enjoy! okay, this may sound overly dramatic, but i think God may have led me to you (via catherine, of course). i wanted to pop over and say thanks for stopping by, and my heart almost stopped when i say this post. i had a couple (or 30) of these at Christmas and the lady that made them was supposed to give me the recipe, but never did. you made my day. and believe me, my day needed making! thank you!!! I was a bit worried that these really were buckeyed peas covered in chocolate, I am relieved to see thats not the case:). Yummy, I've made the buckeyes before. They're delicious!